Consumption of visual content has exponentially grown in the last few years, especially after the increase in mobile penetration and broadband speed. 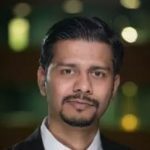 Digital platform players like Apple, Google, Netflix, Amazon, Hulu etc. further help to increase the universe of digital content for mobile first consumers. Consumption of digital content naturally drove the needs for larger mobile screens. 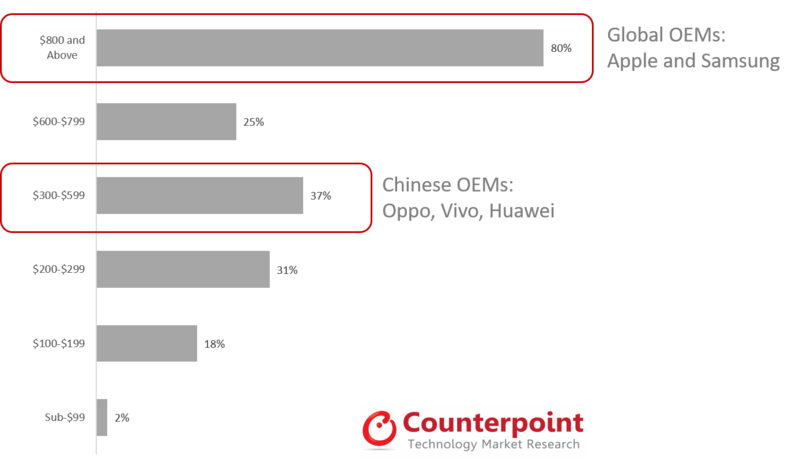 Riding on this trend, many leading mobile OEMs especially from China i.e. Oppo, Vivo, Huawei focused on phablet smartphones (5.5 inches and above) and this trend was also adopted by giants like Apple and Samsung. It is now a norm in smartphone design to have a 5.5” or larger size display. However, smartphone-size has its limits and increasing the display size without increasing the overall size of the phone is the trend now. In 2016, Xiaomi launched Mi Mix as an experimental limited-edition product, showcasing the technology trend of the future with an almost bezel-less design. This was heavily based on the initial design of Sharp, the display manufacturer. LG’s G6 commercially introduced a 5.7-inch LCD display with an 18:9 aspect ratio in early 2017. Thereafter, Samsung introduced the Galaxy S8 with a 5.8-inch curved OLED display. Fast forwarding to early 2018, 18:9 display aspect ratio is now becoming the new norm for smartphone design. 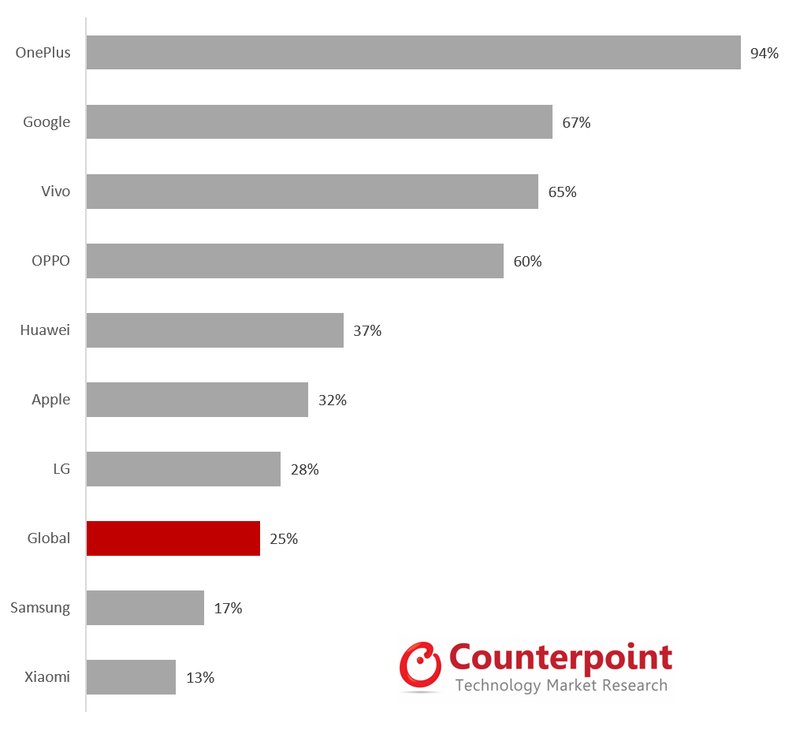 As per Counterpoint’s Monthly Market Pulse research, one in four smartphones sold during February, 2018 had an 18:9 or higher aspect ratio. As we have seen, Chinese OEMs have been the “early adopters” of any new technology and they are swiftly transitioning their entire portfolio to 18:9 displays and the top Chinese brands such as OnePlus, OPPO, vivo, Huawei are driving this trend. Chinese players are leveraging their supply chain and ability to rapidly scale, to leapfrog the competition and lead this trend. 18:9 aspect ratios are penetrating lower price-tiers, accelerating month-to-month. We estimate at least 35% of the new smartphones sold will sport this new aspect ratio by the end of 2018, up from 25% in February 2018. Display manufacturers like Samsung Display, LG Display, and Japan Display Inc. will benefit from the increase in the device display footprint and Chinese suppliers such as Tianma, BOE and CSOT will help it further proliferate into different price-tiers. OEMs will also be more aggressive in adopting the next display trend (19:9) or bezel-free smartphones, and therefore advance orders to acquire display material could be a priority. This display trend will also drive innovative biometric solutions such as Apple’s FaceID or under display fingerprint sensors to complement this new design language.